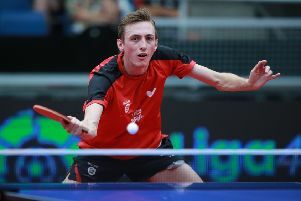 Liam Pitchford in action against Timo Boll. (PHOTO BY: Remy Gros/ International Table Tennis Federation). 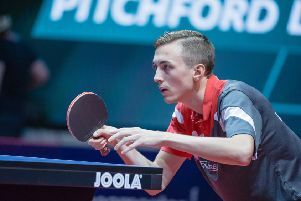 Pitchford had to battle his way through three qualifying rounds to reach the main draw of one of the strongest events on the International Table Tennis Federation World Tour, but then eliminated Robert Gardos, of Austria, and Koyo Kanamitsu, of Japan. It set up a quarter-final against German left-hander Boll, who beat him in the last 16 of the European Championships on his way to gold earlier this year. Pitchford put in a huge performance to gain revenge 4-2 (11-6, 11-6, 5-11, 8-11, 13-11, 12-10). The semis proved one step too far, however, as he was defeated, although not outclassed, by world number two Xu Xin, of China, 4-0 (11-9, 11-7, 11-7, 11-6).